Life as an orphan out on the western frontier was full of hardships. Without parents, orphans bounced around from distant relative to distant relative. It was a lonely life for most, who were often treated like servants in the homes they occupied. According to Levi Hutton, life with his uncle was so unbearable he ran away to fight Indians at age 15, only to return on account of his empty stomach. But by 18, he had headed out west to make it on his own. In 1887, Levi married fellow orphan May Arkwright, and moved to Wallace, Idaho seeking fortune. After investing all they owned in Wallace's Hercules mine, the Huttons struck it rich in 1901. Though their lives were changed by wealth, they never forgot their orphaned pasts. 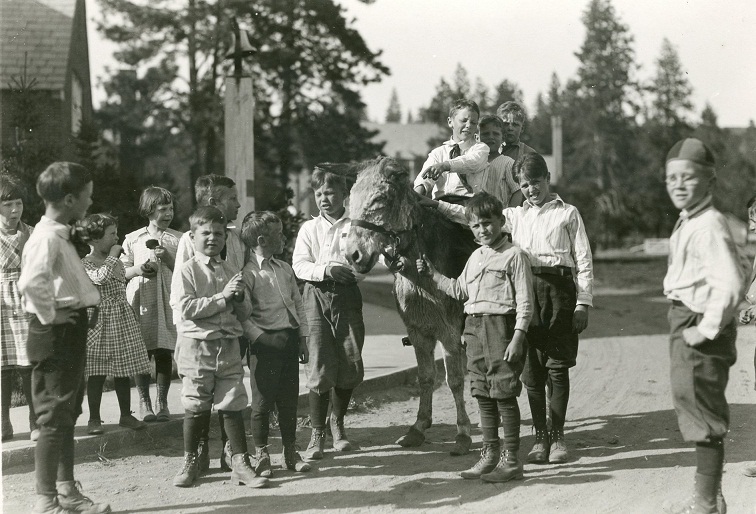 Having moved to Spokane in 1907, the Huttons were actively involved in community charity organizations.The two were very involved at the Florence Crittenton Home which housed unwed mothers and their children, and often took groups of orphans to the circus and other events. Having no children themselves, the Huttons even provided a loving home for several children under their temporary care. 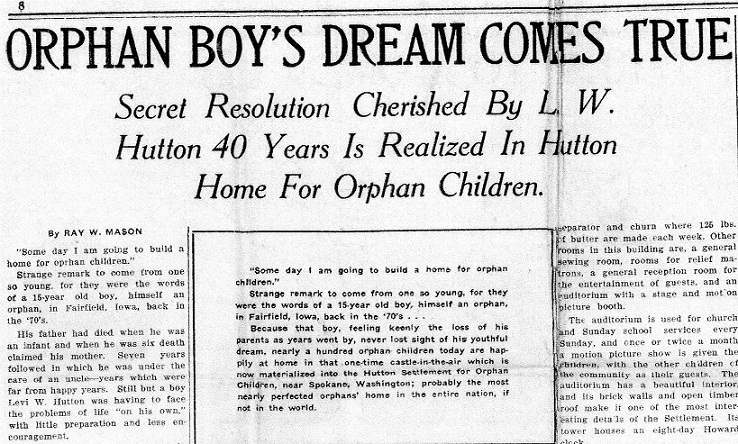 After May Hutton's death in 1915, Levi Hutton, who often recalled the hardships of his childhood, began planning a home for children who have been abandoned, orphaned, or abused. This home, according to Hutton would provide a loving home that fostered self-reliance and confidence in the children it housed. 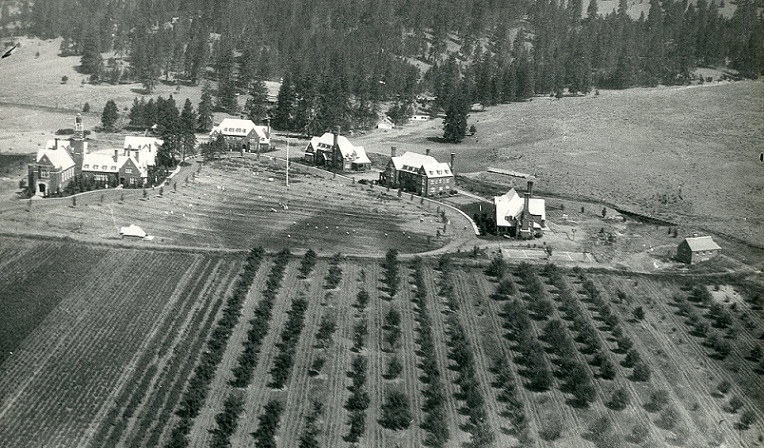 In 1917, Levi Hutton had established the Hutton Settlement on over 300 acres of land. The settlement was designed to provide a "Happy Home" for children while teaching them skills through working on the farms located on the site. The Settlement is privately funded through a carefully organized trust funded by the Hutton fortune, and was intended to be self-sufficient by using the crops grown on the property for food. In addition to the 9 buildings on the site, there is a barn, vegetable garden, and land for farming. Upon his death, Levi Hutton secured the future of the Hutton Settlement by giving almost all of the Hutton fortune to to the project. Levi Hutton believed bequeathing his and his wife's fortune to the home was the right thing to do. To this day the Hutton Settlement continues Levi Hutton's vision of providing a home for children. It continues to focus on providing a home and family for those who have none. The Settlement's continued commitment to the well-being of children is a standing testament to the Huttons and will continue to be for years to come. Areal view of the settlement, c. 1920's. : Designed to be self-sufficient, the Hutton Settlement has enough space to house the children, as well as provide land for farming and livestock. Image courtesy of the Northwest Room, Spokane Public Library. Orphan Boy's Dream Comes True: Levi Hutton's dream of building a home for children was finally realized in the Hutton Settlement. Almost all of the Hutton fortune was left for the management of the children's home. Image courtesy of the Northwest Room, Spokane Public Library. 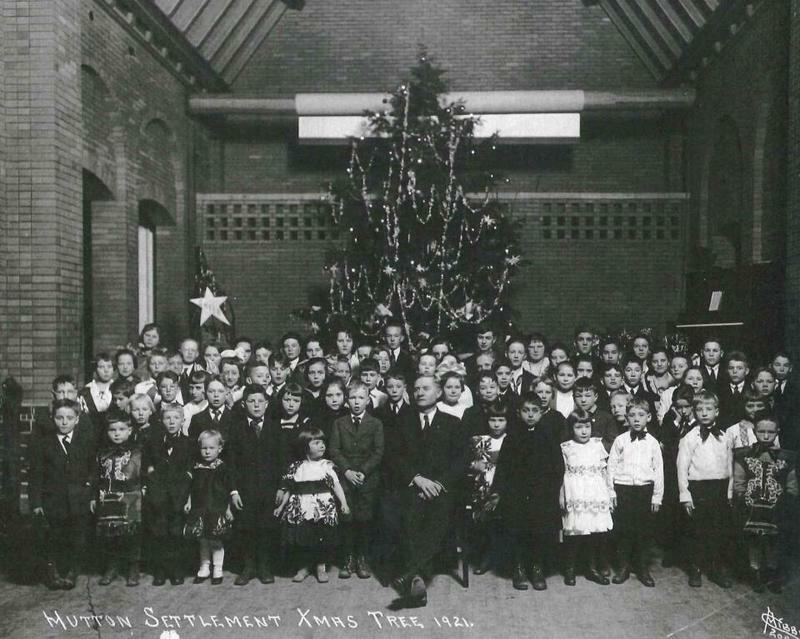 Christmas, 1921: Levi Hutton (center) and the children of Hutton Settlement in 1921. Image courtesy of Hutton Settlement. Children having fun on the settlement, c. 1920s. : Unlike many orphan institutions of the day, the Hutton Settlement sought to provide a family-like setting that encouraged children to have fun and develop individuality. Image courtesy of the Northwest Room, Spokane Public Library. Building on the settlement, c. 1920's. : The Hutton Settlement was designed to group children into family sized settings, the buildings on the site housed the school, cafeteria, gymnasium, auditorium, and quarters for the 30 children it housed. Image courtesy of the Northwest Room, Spokane Public Library. Anna Harbine, “Hutton Settlement,” Spokane Historical, accessed April 24, 2019, https://spokanehistorical.org/items/show/293. Arskey, Laura. "In No Uncertain Terms: From the Writings of May Arkwright Hutton". Pacific Northwesterner , Westerner, Spokane Corral 52, no. 1 (April 2008). Spokane Public Library, Northwest Room. Ellensburg Daily Record. "Hutton Settlement the Realization of a Resolution Made By an Orphan Boy". February 23, 1920. Google News. "Hutton Settlement and Boundary Increase". National Register of Historic Places Inventory-Nomination Form. United States Department of the Interior, National Parks Service. City-County of Spokane Historic Preservation Office, Hutton Settlement. http://properties.historicspokane.org/_pdf/districts/national/district-national-24.pdf. Hutton Settlement. "Our History". http://www.huttonsettlement.org/history. Pratt, Grace Roffey. 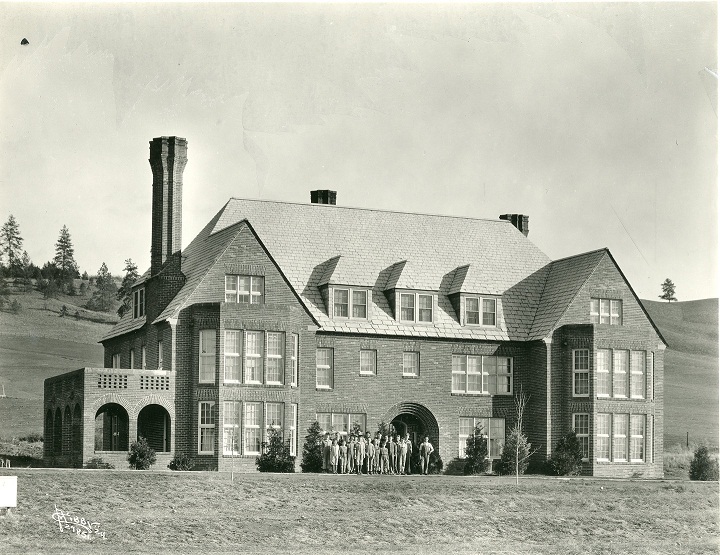 "The Great-Hearted Huttons of the Coeur d'Alenes". Montana: a Magazine of Western History 17, no. 2 (April 1967): 20-32. Spokane Public Library, Northwest Room. Spokane's First National Bank. Levi Hutton Builder of a Dream. 1974. Spokane Public Library, Northwest Room. Spokesman Review. "Demand Estate of Mrs. Hutton". January 7, 1919. Spokane Public Library, Northwest Room. Spokesman Review. "L.W.Hutton Dies; Spokane Mourns". January 4, 1928. Spokane Public Library, Northwest Room. Spokesman Review. "Orphanage Deed Filed By Hutton". February 2, 1920. Spokane Public Library, Northwest Room.